District (Russia) and Lithuania through international roads. Giżycko is within a hundred kilometres from the Russia-Poland and Lithuania-Poland borders. Due to its nature and location assets, Giżycko is one of the main tourist-recreational centres of the region. Giżycko, with its 30 000 inhabitants, is a young town; 27% of the towns citizens are under 18 years old. Thus young, qualified human resources are available on the work market here. The town has a number of secondary schools of different educational profiles as well as a higher education college with tourist and information technology departments. Permanent expenditure on infrastructure development and building industry resulted in the complete service infrastructure. A modern sewage treatment plant that meets all the nowadays requirements was opened in 2003. The tourist resource base is developing constantly, ready to satisfy demanding customers. The main branches of the towns economy are tourism, services, food processing and trade. Giżycko is a tourist- and investor-friendly a place then. Giżycko is situated in the North-East of Poland, in the centre of Masurian Lakeland, on the isthmus between Niegocin and Kisajno Lakes. Within the boundaries of the town there are two more lakes: Popówka Mała and Popówka Duża. The area surrounding the town is a land of significant travelogue attractiveness - lots of forests, large lakes, beautiful landscape of postglacial hills and favourable climate. 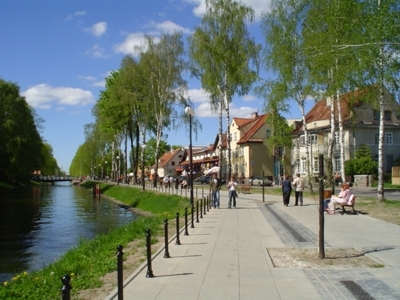 Niegocin and Kisajno lakes are connected to the rest of Masurian Lakes with nine canals and two locks. 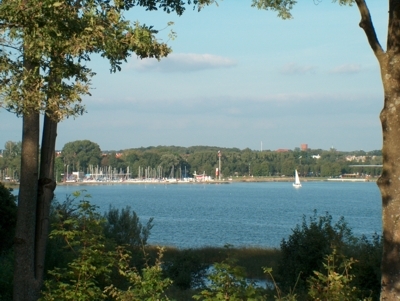 Therefore Giżycko is one of the major tourist-recreational centres. Favourable relaxation circumstances, well-developed tourist base and varied leisure offer make the number of visitors constantly grow. Giżycko is also the biggest district town of the region, with district authorities offices, banks, insurance companies, societies, foundations, culture institutions and educational institutions. Another factor proving the openness of Giżycko citizens is the fact that the town has been running a lively cooperation with foreign countries, i.e. Germany, France, Ukraine and Lithuania. Ekomarina building is bound to be started soon, in the neighbourhood of a five-hectare area planned for a multi-purpose recreational and service complex. In the project, it is planned to develop vast part of Niegocin lake shore. It is planned to build a recreational and tourist complex and a port with 292 docking places combined with yacht-sewage absorption system and sanitary sewerage. 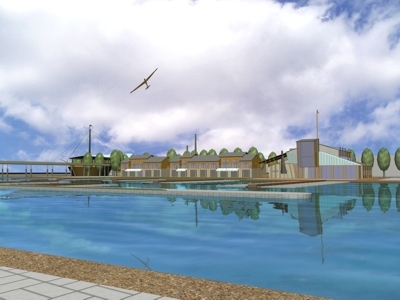 The main Ekomarina building will contain restaurants, shops, sailing shops, boat-builder workshops, port authority etc. Terraces and conference halls are also planned there. Execution of the project will strengthen investment attractiveness of the town. Area: complete service infrastructure; 100m distance to Niegocin lake and port in the centre of the town; located in the area limited by Kolejowa Street, Dąbrowskiego Street and Wyzwolenia Street. The area has the potential to create a totally new town centre containing all the necessary service for citizens and tourists. Area: complete service infrastructure; located in the southern part of the town, directly by the towns ring road (a transit road managing the traffic in all directions). The district enables location of services, industry and storage (excluding the environmentally unfriendly and harmful ones); an ideal place for industry, crafts, storages, tenant back-up facilities, gastronomy and hotels. Boyen Stronghold is one of the best preserved monuments of 19th century fortress architecture in Poland. It makes the stronghold extraordinarily attractive. Hidden in a forest park, it was built in 1843-1851. It is located on a hill on the isthmus between Kisajno and Niegocin lakes. It has four main gates, is star-shaped; each fort makes an individual stars arm. Area: 307 380 sq. m (divided in 5 building lots); located within the towns boundaries. Intended use: Fortification complex appointed for global renovation under supervision of the historical monuments conservator (according to the project of town development); according to the project places for recreation, tourism, conference halls etc are soon to be appointed. Suggested investment type: no transformations that would impoverish the historical character of the place are allowed; no works are allowed without prior consultation and accord of the provincial office of historical monuments conservator.